The Boomerang nebula (Centaurus bipolar nebula, PGC 3074547) is a protoplanetary nebula in the Southernconstellation of Centaurus. It is known for being the coldest place in the universe with a temperature of only 1 kelvin (-460 degrees Fahrenheit/-272°C). Like many nebulae such as the Omega nebula, its name derives from early observations when it was not visible in its entirety. In this case, the lobes were not fully visible; instead only a slight curve was that appear very much like a boomerang. It is also sometimes known as the "Bow Tie nebula," a name it shares with the planetary nebula NGC 40. 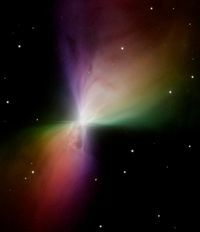 The Boomerang nebula was discovered and named in 1980 by Keith Taylor and Mike Scarrott. They observed the nebula with a 3.9 meter telescope at the Siding Spring Observatory in New South Wales, Australia. Unlike in modern images of the nebula, they were only able to make out a slight curved shape of the nebula's two lobes, which in their minds resembled a boomerang. 15 years later in 1995, a radio telescope (the SEST in Chile) was utilized to measure the temperature of the nebula. It was subsequently measured to be only 1 kelvin (-460 degrees Fahrenheit/-272°C), making it what is believed to be the coldest place in the universe. This is even colder than the cosmic microwave background which itself has a temperature of only 2.7 kelvin. Detailed observations by the Hubble Space Telescope in 1998 revealed that the gas in the nebula is in fact distributed in a sphere rather than a bow-tie as is often seen in images. Observations by the ALMA radio interferometer showed vast quantities of gas enveloping the two large lobes. This gas was seen using the sub-millimeter region of the electromagnetic spectrum. The nebula is thought to lie some 5,000 light years from Earth. With an apparent size of 1.445 × 0.724, its physical size corresponds to 0.33 × 0.17 light years. Intervening dust causes the nebula to appear to be hourglass shaped though its structure is more complicated than this. It consists of large, rapidly expanding gas cloud as well as a small toroidal (doughnut-shaped) cloud that is much denser and surrounds the central star. This smaller region of gas block light traveling outwards from the stars equator (i.e. perpendicular to the axis of the lobes) meaning only the lobes are illuminated by the star's light and visible. These is also appears to be a hollow cylindrical structure surrounding the star itself, thought to have been formed jets of hydrogen and helium gas emitted from the star's polar regions. This complicated structure is believed to be the result of the ejection of gas and dust by the nebula's central star, a red giant. The gas in the nebula is expanding rapidly, at some 164 km/s. It is this rapid expansion is thought to have cooled to the nebula to only 1 kelvin. This page was last modified on 14 December 2018, at 14:42.